By now, you’ve probably heard of the Columbia alumni who hold top spots in the current administration, including Attorney General Eric H. Holder Jr. ’73, ’76L; Federal Communications Commission chairman Julius Genachowski ’85; and of course President Barack Obama ’83. But there was a lower-level surge toward Washington, D.C., as well, a migration of recent graduates wanting to help implement the agenda that Obama had laid out in his campaign and learn how government works from the inside. In addition to Josh Lipsky ’08, who works in the White House visitors office and was the subject of CCT’s January/February “Alumni Corner”, here are three more young College alumni who are serving on the front lines in the administration. For Lukas McGowan ’07, going to the office every day means something rather special — walking through the doors of the White House. That’s where he works as a correspondent for Vice President Joe Biden, drafting letters on behalf of his boss to anyone he might need to communicate with: the Dalai Lama, perhaps, or the prime minister of Spain. McGowan had never set his sights on government, but politics uprooted his life at an early age. When he was in middle school, during Bill Clinton’s second term, his father, Gerald McGowan, was appointed ambassador to Portugal. So, the seven-child McGowan family decamped to Lisbon, going from eating spaghetti most nights in Northern Virginia to having a staff of eight at a palatial residence in a European capital. McGowan, who has a ready smile and easygoing manner, didn’t consider himself an activist when he got back to the States. A political science major, he loved the Core Curriculum, played intramural soccer and immersed himself in the delights of the city rather than College Democrats meetings. When graduation rolled around, he signed on with an investment bank in New York. Politics, however, got in the way again; though McGowan had been supporting fellow Virginian Mark Warner for President, things changed when Obama jumped into the race. Obama won Iowa, and the victory made him a real contender. But that was only the beginning for McGowan, who in the next several months sped through California, Ohio, Wyoming, North Carolina and Puerto Rico, leaving to help organize the next area as soon as the last one’s primary was over. For the general election, he settled into Virginia, and his work contributed to the first Democratic presidential win there since 1964. Soon after Obama’s victory, McGowan went to Washington, working on the transition team until he was offered a spot on the Vice President’s staff. Though the hours aren’t as crazy as his field organizing days (he’s usually off in time for dinner), there’s a different kind of pressure — his boss, after all, is one of the men running the country. “In the campaign, we understood that losing wouldn’t be the end of the world,” McGowan explains. “Now that we’re governing, we don’t have that choice. The stakes are so much higher now.” And now, McGowan is not only drafting Biden’s letters but also his speeches: He wrote the first draft of the Vice President’s remarks on Earth Day and jumped at the chance to write for an appearance in McGowan’s old turf, Iowa. On a day-to-day basis, though, there are considerable perks to McGowan’s job: directing the vice presidential motorcade through New York City, for example, or playing basketball with White House staff and elected officials. Sometimes, even senior adviser David Axelrod stops by to shoot a few hoops. “He’s good!” McGowan says. McGowan isn’t sure what his next career move might be — right now, he says, there’s just too much going on to think about it. As assistant to the head of the Small Business Administration, Subash Iyer ’07 is smack in the middle of the federal government’s attempt to salvage the U.S. economy, and he got there almost entirely by accident. 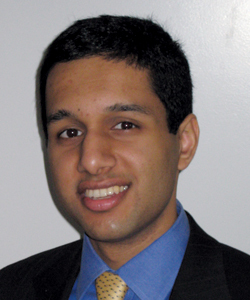 At Columbia, Iyer, an economics-political science major, devoted his extracurricular time to activities that skirt the edges of politics and policymaking. He traveled and competed with the mock trial team, practicing legal reasoning and rhetoric. His speech still is speckled with debater-ish phrases such as, “At the end of the day … ”. So Iyer jumped into the intense life of an entry-level consultant, putting in 14-hour days at McKinsey & Co., helping to unravel the management problems of large corporations. He asked for, and received, a broad range of assignments, from health care to financial services. The case he most enjoyed was the only one he did for a public entity: a study on Maine, recommending ways in which the state could close a budget gap without cutting services. In December 2008, Iyer received a call from Karen Mills, who had headed the Maine economic council that had brought in McKinsey. President Obama had just appointed her to head the Small Business Administration, and she had been impressed enough with Iyer’s work on the Maine assignment that she wanted him to come along. Iyer didn’t need to be asked twice. He packed up his life in Manhattan and moved to Washington, D.C., soon after the inauguration, settling into an office in the maze of federal buildings south of the Mall. When he arrived, the Small Business Administration itself was in need of some McKinsey magic: Its budget had been cut significantly during the Bush administration, and morale was low. But the SBA had become a key element of Obama’s strategy to kick-start the economy; legislators allocated $730 million in stimulus funding to distribute to small businesses across the country and looked to the agency to guarantee loans when banks weren’t lending. Unlike many positions in federal bureaucracies, Iyer’s job isn’t confined to the Washington bubble. He has traveled around the country to meet with small businesses, helping the SBA maintain a strong local presence. Recently, he transitioned from advising Mills on policy matters to working directly with agencies to help them award contracts to small businesses — especially those owned by women and minorities — as Recovery Act money flows through the federal pipeline. Iyer grows animated as he talks about the problems his agency has been helping to solve. “It’s fascinating,” he says, describing how nearly a quarter of all government contracts go to small businesses, or how the SBA guarantees more than $80 billion in loans. Washington, D.C., would seem like a natural post-college destination for George Krebs ’09, whom his classmates know as the ebullient social butterfly they elected to two terms as class president and then president of the Student Council during his senior year. After all, it would make sense for him to follow the man upon whom he had modeled his own administration. 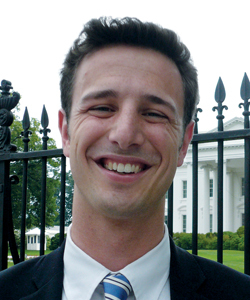 Krebs first saw Obama at a campaign rally in July 2007, and the next summer he passed up more lucrative internship opportunities to volunteer with the campaign’s new media operation. In helping to run the blogs and social networks of my.barackobama.com, Krebs became part of the team that knit together thousands of Obama supporters in the most successful online outreach effort politics ever had seen — exactly what Krebs had worked to achieve in his own political career. Krebs’ successful campaigns featured high fives and bear hugs rather than advanced web applications, and promised the ability to use flex points off-campus rather than comprehensive healthcare reform. But the idea of constant interactivity carried through to his work for Obama. Along with the luckiest of Obama’s volunteers, Krebs found his way into the administration after graduation. He’s still doing new media, but this time for the FCC under Julius Genachowski ’85. The FCC has been making headlines by pushing forward with “Internet neutrality,” or keeping the web free of restrictions on content and types of access. Krebs also is supporting a lower-profile but no less important project: expanding broadband Internet across the country, using funds from the stimulus package passed last year. Like Obama’s web campaign operation, the FCC also is leading the federal government’s charge into the world of Web 2.0. 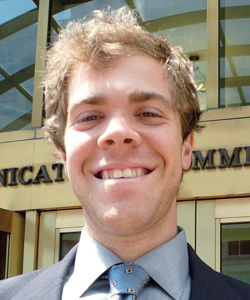 As such, Krebs has done the federal government’s first official live-blog and also manages the FCC’s Twitter feed, which has garnered more than 341,000 followers since it started in mid-August. Krebs speaks with glee of its rapid early growth. “In 80 tweets, I’d grown larger than the EPA! State department, you have 9,000 [tweets], I’m coming after you!” he crows. Krebs doesn’t plan to stay in D.C. forever — he misses the boundlessness of New York City and plans to leave for graduate school at some point. In the meantime, he says he has been pleasantly surprised by the atmosphere in a large federal bureaucracy such as the FCC. Lydia DePillis ’09 majored in history and lives in Washington, D.C., where she covers real estate and development for Washington City Paper.